By introducing simulations and predictions, we have created a job type that does not coexist well with the interactive website. These jobs must be outsourced to another machine (or a pool of machines). These jobs are executed as batch-jobs, i.e. they don't need user interaction. Jobs must be self-contained. A job should describe where to get input data (fully qualified URL) and where result data should be published (also fully qualified URL). The lingua franca of the mySmartGrid ecosystem is JSON. Most visualization is done directly using JSON. The (new) data submission API also employs JSON. Therefore, result data (such as a predicted timeseries) must be represented as JSON data and published via the HTTP protocol. The simulations must run on a different system as the webserver. The beanstalk protocol is very simple: https://github.com/kr/beanstalkd/blob/v1.3/doc/protocol.txt. This is a very good thing(TM), because it leads to a bunch of client implementations that are ready to use. 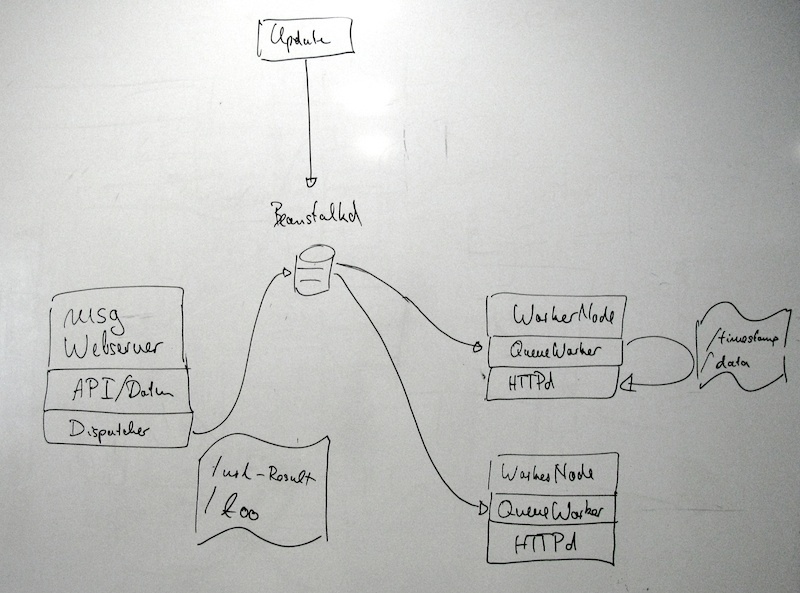 The architecture consists of a webserver, several worker nodes and a beanstalkd instance. The webserver can submit jobs to the beanstalkd queue. A job is a JSON-formatted document containing the desired result URL and $foo as input data for the job. The worker node then retrieves the job from the queue and dispatches a process locally on the worker node. As soon as the process finishes, the job is deleted from the queue. The results of the job are published using the local HTTP server. Again, data is JSON-formatted. In order to be able to detect outdated information, a timestamp MUST be included in the result file. Right now, there is no redundancy in the system. I assume that the webserver decides which workernode should run the job. So, the results are accessible on an URL like http://worker1.mysmartgrid.de/<UUID>. This makes it easy for the webserver to render pages that include a link to the data. The web browser of the users can then access the data seamlessly. A loadbalancer makes a group of worker nodes accessible. All results are available using the base url of the loadbalancer. Worker nodes work on a common queue. The results are rsync'd across all worker nodes. If one worker fails, it is not used by the loadbalance any more. The other workers run the additional jobs. In the long term, this setup should be much more stable. Right now, however, it seems to be overkill. The library consists of a producer, a qworker and the drunken sailor. The producer puts job in the default tube. This should be used as a template on how to put jobs (JSON-formatted) in the tube. The qworker deals with the execution of jobs in a reliable way. It is capable of forking jobs, monitoring them and reacting on failure conditions. The drunken sailor is a test program that simulates all kinds of misbehaving jobs, i.e. non-terminating jobs. Smaller tasks such as sending emails etc. can be implemented directly in the ruby library. TODO: Provide a framework of Jobs for this. Algorithm did not terminate within expected timeframe. Job not found, cannot release it. Ignoring. Algorithm terminated within expected time constraints. Job failed, leaving job in queue. Job completed, removing from queue. json_payload,   # Content of the job. pri=1337,       # Priority of this job. <1024 is considered urgent. delay=0,        # Should the job be delayed for X seconds? ttr=3          # Seconds until the job will be re-queued. This is not exposed to the user, but a real producer application should of course implement adequate settings. The result directory /var/tmp/qworker/bc/bc3a925099b9012e0f06549a20077664 is created for each job. http://tomayko.com/writings/things-caches-do Note for the future: Check out Varnish.